I have a confession. I was never a great lover of container planting. 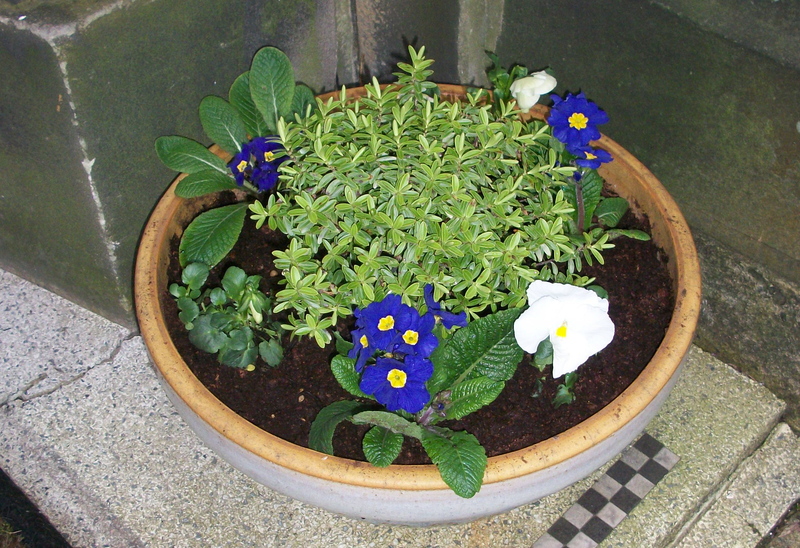 I have always short-changed my pots and window boxes, by shoving left-over plants or a few scraggly pansies into them hoping that by some miracle they would suddenly burst into masses of gorgeous flowers. Not any more, however! I have been doing quite a lot of container planting for clients and finding many unexpected pleasures from it. Like designing a border, it takes some planning. You have to consider where the container will be placed, what its function is, and what plants will work together. It is also important to consider whether you need instant effect, or whether it will be a container which will come into its own later in the season. I also used to fill my pots with only summer annuals and herbs, overlooking the fact that there are many other plants that can be used to extend the range of possibilities – and the season too! For early spring planting, when bedding is too tender to plant out, small herbaceous plants and shrubs can do the job with interesting results. Recently I have used Heucheras and Euphorbias to give baskets structure. Hebe White Gem looks lovely in a bowl with bedding plants encircling it. Herbs of course are lovely in containers, and you can position them according to their needs. I am always searching around for herbs that will tolerate shady conditions as well, and currently my favorite combination is curly parsley, pineapple mint and lemon balm. The scent is caught on the breeze and it is charming and refreshing. I have always thought that you had to cram as many plants as possible into containers – in the style of the hanging baskets which seem to contain a whole garden! They are lovely but smack a little of civic planting. I have learned not to be afraid of keeping it simple. That can be very effective too, especially when containers are grouped together. Hostas and ferns are great examples of what works on their own, and they look spectacular! I could go on, but I shall stop here and let you go and plant your own pots up ( unless you want me to do it! ).